Log in, open your profile and the folder My solution. Click on the button Create a solution. At the beginning, it is necessary to choose an eye catching headline. Do not forget to use the key word which will differ you from the competition. As next step, it is necessary to choose the category in which you will advertise your work. You can choose from large number of categories, which are systematically divided into 8 areas: Development, Trade, IT and Software, Design, Marketing, Office Productivity, Writing and Translations, and Music and Audio. In following step, you need to write a preview solution and then also the full description of the solution. To this information it is possible to add the cover photos and attachments. The hardest decision is waiting for you at the end of the form. You have to decide whether you will offer your solution for free or for a fee, or for how high fee (calculated per hour). 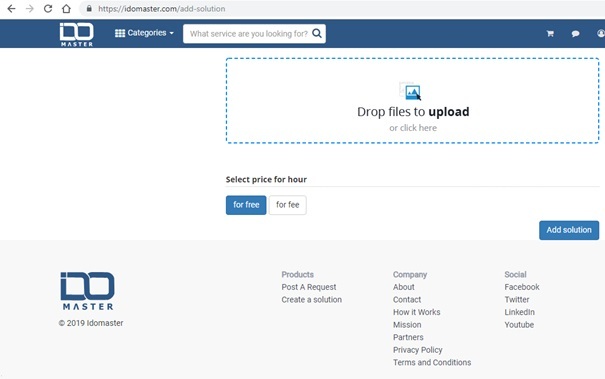 The excellent thing is that page itself will include the amount of the tax and the fee for the portal to your required amount, so you can immediately see the final amount that appears to potential customers. After that just press the Add solution button and wait for the approval by the portal´s administrator. 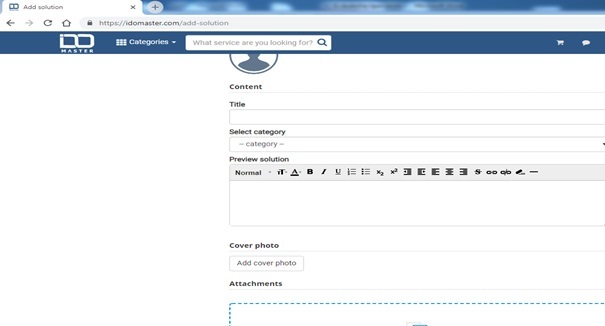 Then, finally, you can find your solution on your profile under the folder My solutions or in the category in which you included it. What acts as a very nice surprise, is the fact that as a bonus for 5 added solutions you will get the 25% discount coupon on a whole range of offers. Although the site does not do big promo around that, this idea is necessary to appreciate. After all everybody is sometimes missing something and get the service cheaper just for adding your own solution is really exceptional. Author adminPosted on 26. January 2019 26. January 2019 Categories FAQTags How to add your solution? Next Next post: How to buy the necessary solution?